Ok, so everything on this site can’t be serious and stale. If we don’t have a sense of humor about the absurdity inherent in the state of affairs we find ourselves in we’ll only get mad and throw things. In that light I wish to share with you a story from my recent life and my thoughts concerning it. The other day my friend Emily told me something that made me do a double take. You see, she moved back home over winter break to her parents house in Iowa. Now her parents aren’t exactly what you would call extremely rational people. They are more like you would call extreme religious weirdoes with nothing better to do with their time than provide me with a constant source of sad but very funny anecdotes of faith gone awry. Emily recently decided she didn’t want to attend her family’s place of worship anymore and decided that she would adapt a more moderate stance to religion in hopes of finding truth amidst the absurdity that is the protestant church. To add to this, while she had been away at college she had been turned onto some Stephen King books, which I suppose she should be commended on getting through, and rap music, of which I have little opinion. Now her parents being the weirdoes they are did not like her bringing such things home with her and made no bones about it. Telling her not to play it around her younger siblings, leaving these tainted items laying about so their impressionable young minds wouldn’t be diseased by the horrendous content they possessed. Now she followed these rules over break and came back annoyed that at every chance they had had, her parents tried to convince her she was in trouble of leaving the faith of Christianity and that she was not living a Godly lifestyle. This was cause for some chuckles because Emily attends the local Nazarene church like clockwork and loves being around the members there. By all accounts you could probably say she’s more religious and Godly than I am, not that it takes much effort to do so. Now you and I chuckle, but Emily was not happy at all. Her room had been gone through not only by her mother, but by total strangers in hopes of casting the devil out of her Stephen King novels and whatever else they might have happened to find. All in the name of the Godly way of life and all. Of course, while humorous and shocking as it is, its not something i was entirely suppressed about. Her parents have treated me, in the times have had the misfortune of being in their presence, like I’m the leader of a secret movement to destroy all things church. Emily was forbidden to visit my house recently, didn’t stop her, because of the same “evil spirits” that apparently inhabit my house and make it a den of suffering and despair for all who enter. Though with my brother in the house who knows, right? At any rate, the crap really hit the fan when Emily decided to show them this site. To wit I am told they found it appalling, disrespectful, full of “earthly logic” and “arguments” (more on that in a later issue) that they just wouldn’t lower themselves to commenting on, and bordering on heretical. I guess i get the fundamentalist seal of approval then. They really liked the article on speaking in tongues, describing it as “a mockery of the holy spirit” and “a source for divine retribution.” So now I’m even more infested with evil spirits and the like. The point of the story, besides the obvious humor, is the sad fact that they, unlike me, are not prone to making light of anything relating to God. And so it follows that they really believe the stuff they are spewing from their mouths in an attempt to “glorify god.” If anything they are glorifying their piety and their own acts. Is this what most christians today are like? Because whether or not they really are all like this, this is how they are perceived by the populous who are non-christian, you know them better as, those people we have to save, precisely because of people like this. The image they project of how Christians really are is that of irrational people who condemn everything they disagree with as “of the devil” and proceed to make fools of themselves, and the rest of us too while they are at it, trying to rid the world of whatever it is. People, including Christians, have the right to decide for themselves where they are going to be spiritually. If someone wants to be so spiritual they rid themselves entirely of worldly things, so be it. If they want to wallow in sin, we can help and suggest, but we cant force. If we force, like in this case of the anointing, we not only invade the other person’s space and life, we drive them away. Emily is still hopping mad at her parents as far as i know. Driving away your own child is sad enough, but a child is still bound by blood to their family, a run of the mill “sinner” is not. They will easily take this kind of behavior as representative of all Christians and you will have lost a soul because they didn’t want to hear how evil their life is and how they aren’t as good as someone else. The moral of this story is, don’t be a fundamentalist, be a Christian. Be like christ, live among the sinners and understand why they sin and talk to them about it. Ask them why, if they don’t want to talk about it, that should be the end of it. Let them come to you and let them know you are there for them to come to if need be. Be an example, not a rubber stamp. So thats it for my little story of absurdity. As an aside i should point out that if her mom can sense evil spirits so well, it must mean she’s a medium and therefor a sin in and of herself. (Take that one) And for those of us who think this behavior is retarded. I have a wallpaper just for you. Tell them you aren’t going to take their abuse by admitting to their accusations! 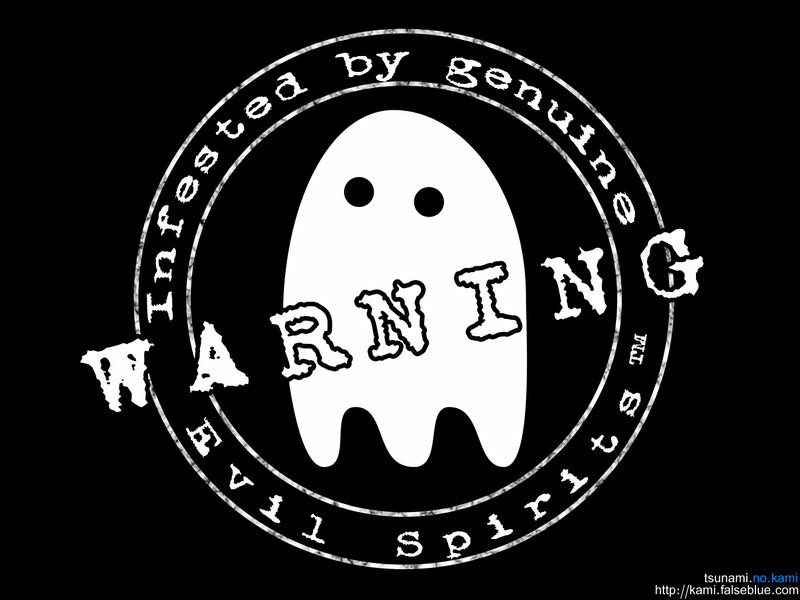 Warning: Infested by genuine Evil Spiritsâ„¢. Too many times I hear the phrase “the moral police” used in accordance with over zealous christians who want to impose their view of morals on the people of this world. And as much as I would love to say the opposite, the people of the world are right on this one. Where does the Bible say “And ye shall smite the infidel with the law of God” or “Make disciples of all nations, by holding them at gunpoint”? Because thats basically what you’re admitting to doing by engaging in such reckless disregard for the free will of others. Is it not the muslims who convert by sword? Was it not the nazis who converted by gun? Who then are we when we say “take such-and-such off the air so no one can see it”? How are we any better? People are not going to see the error of their ways because you quash their entertainment. In fact the opposite will occur! Take away a child’s toy and he will hate you. Hide something from a child and he will want to see it. Forbidden fruit is tempting and all the more delicious because it is forbidden. So then, if vile and disgusting media exists, and we hide it from everyone, what do you think will happen? They will want to see it all the more. The fact of the matter is that we cannot change anyone by changing the media. The world is the world after all and we are told to not become like it yet still live within it. Not once in the New Testament is someone changed by destroying all that conflicts with God’s word. In fact just the opposite. Paul used the Unknown God in Athens to teach people about the true God. What do you think would have happened had he gone in and destroyed or stolen all the idols of Athens? He would have been executed by a mob. And what good would he have done to the world had that happened? 1 Judge not, that you be not judged. 2 For with what judgment you judge, you will be judged; and with the measure you use, it will be measured back to you. 3 And why do you look at the speck in your brother’s eye, but do not consider the plank in your own eye? 4 Or how can you say to your brother, “Let me remove the speck from your eye’; and look, a plank is in your own eye? 5 Hypocrite! First remove the plank from your own eye, and then you will see clearly to remove the speck from your brother’s eye. Judging the world by your standards is ridiculous by any stretch of the imagination. If we did something here in America that was illegal in Japan, is it just and fair for the Japanese to come arrest us? No! So then, why do we consider it just and fair to chastise those who do not submit to the law as we have? For their souls? To save them from God’s wrath? The ends do not justify the means! We submit to the law voluntarily, meaning we have a choice to submit or not too. Yet then some turn around and want to force others to submit without a choice because they think they know what’s best for them. But how could they? The Bible does not teach this kind of practice. In fact it teaches the opposite. In every case in the New Testament, people were converted by the word. And I don’t mean the word in so far as how it would send them to hell if they don’t follow it. They were persuaded by the fact there was salvation for them. Only then did they accept to be judged by God. I know you ask “well, how do they know they needed salvation?” Because the word appealed to them as human and they saw they were messed up on the inside. But if they were told they were messed up inside instead of coming to that conclusion on their own, that would only have served to alienate them. You cannot dictate who is sinning and who is not! Who is the judge of such things? Is it not the one who writes the law? And is that you? No! You are but a follower of the law. You are not the judge. Therefore, the way to conversion is through a personal means. If you want to make someone not listen to music, sit down with them as a friend and ask them why they listen to it. Ask them why it appeals to them. And work from there. Screaming “sinner” will get you no where and will only serve to make those you want to preach to hate you and despise your kind. Personally, I think those who want to ban the world from practices which are worldly are those who are unsure of their own faith. They are too weak in their own mind to resist the world and are tempted by worldly things. Instead of fleeing from the temptation, like we are taught to, they seek to destroy it for everyone. Instead of dealing with their own weakness they simply want to destroy the source of the temptation. Thats like trying to fix a termite weakened house by trying to kill every termite in the world one by one. It cant happen. We are to individually deal with temptation. Worldly things will exist as long as there is a world. Does this mean that they are not subject to the same laws we are? By no means. God will judge by his law. But we are not his hammer. If you don’t like the music, turn it off. Don’t want your children watching trash? Teach them why it is trash. But don’t target producers and labels when you cant control yourself or raise your children to be conscientious about sin. “The Devil made be do it” wasn’t a valid excuse for anyone before. Why now is it a valid excuse to blame media when you control the remote? If you’ve never seen or heard it before let me tell you how it works. As the song service, or any service with a great amount of energy, rises to a fever pitch, suddenly a sole solitary individual will speak up babbling words which no one can understand. The words themselves sound hebrew-like and can go on for a few seconds to a few minutes. When they do so, the whole congregation grows quiet and listens until the person is finished. When they stop speaking a strange and awkward silence follows. The congregation waits for another individual to receive the “holy spirit” and translate to the masses what the other person said. After which there is much praise and celebration for the word they have received. I have a deep and firm belief that this protestant hocus-pocus is pure and unadulterated crap. I think its nonsense and is misleading to the young minds full of mush who sit in witness to this spectacle, being brought up to believe a lie which will ultimately lead to delusions and disbelief. So why do so many of these people believe that these ramblings are divine? I believe the answer lies in their not being able to read the bible for themselves, also the leadership’s poor translation of the bible, and the unwillingness by the general population of these congregations to challenge the status quo in their church. Perhaps their most fervent argument for these Jesus-seances is what is found in the book of Acts. 3Then there appeared to them divided tongues, as of fire, and one sat upon each of them. 4And they were all filled with the Holy Spirit and began to speak with other tongues, as the Spirit gave them utterance. Yeah, its long, but it gets my point across. Look at what the people who were hearing the Apostles speak said about what they heard. First, you need to understand that these are Jews who had moved throughout the Roman empire and were coming back to Jerusalem in order to take part in the festivities. So most of them spoke other languages. Here is something that most people never tell you. When the Apostles spoke in tongues, everyone heard what they said in their own language. In other words, it would be like me standing on a table in the foreign languages department and saying something like “Cheese and EXUBERANCE!” and everyone there, Russians, Japanese, French, Swahili, would all be able to understand what i said (perhaps not the content thereof, but you get the idea =P ). There are NO translators. None. Nada. Zip. There wasnt need for them. The holy spirit allowed everyone to hear and understand with no middlemen. So the very fact that what we hear is ramblings disproves the very idea of tongues altogether, at least as far as scriptures are concerned. We all know that some people could care less about what scripture says and more about what their traditions are, but thats another article. Now some of you may know your bible and say “Hey! What about 1 Corinthians 14 1-25?” Well I’m glad you asked. For further proof that tongues are other languages and to back up what i said about the Mediterranean, check this out. 10There are, it may be, so many kinds of languages in the world, and none of them is without significance. 11Therefore, if I do not know the meaning of the language, I shall be a foreigner to him who speaks, and he who speaks will be a foreigner to me. 12Even so you, since you are zealous for spiritual gifts, let it be for the edification of the church that you seek to excel. Paul is well educated in many languages, as can be attested to by his missionary journeys and his successes therein. It is also probably a major factor in why God chose him to be the greatest missionary ever. All through Acts, there was not one mention of him speaking in babel and then having someone translate for him. And i believe that Luke was scrupulous enough to make mention of it if he had. So then what does the following mean? Therefore let him who speaks in a tongue pray that he may interpret. Its simply to pray to the holy spirit (i.e. god) that those who listen will understand. (It probably means too to pray you dont screw up and say something stupid like “I am a jelly doughnut”) Paul goes on after this (read it for yourself, its too long to post) to say that when he prays in a tongue that his spirit prays but his understanding remains unchanged. This is probably due to the fact that no one can really gain much insight introspectively if one does it using a foreign language, especially when addressing a crowd. You are much too concerned with the words being correct and translating your thoughts in your head that you dont have time to thoughtfully consider what they mean. Not to say you dont mean what you say, heavens no! Paul says his spirit prays, he is putting his all into it, but his all is being put into speaking to others, not into speaking to himself. And now for even more damning proof. BS. This passage explicitly states that speaking in tongues is to be a sign for non-believers. In fact he goes on to say, that when skeptics see this sign they will believe. And if that is so, then when I and others question this practice we shouldn’t even need to be questioning it because it should shun any doubt we have about it. Yet the Pentecostal’s practice just raises more doubts. There are other questions that remain unanswered too. Why didn’t this practice continue through the 2000 years of Christian history, why did it stop and the start again whit the reformation of 1850? Why is the “tongue” used made up of only a few syllables and indecipherable to linguists? The list goes on. In short, this practice is an abomination to the church, to believers, and to those we are trying to win over. It promises God’s words but in the end all we get are human thoughts. And when human thoughts are passed off as God’s proclamations, well, thats when things just get ugly.